Does Chesapeake’s No-Drilling Pledge Do Enough to Protect NYC’s Watershed? Last week, the largest natural gas lease holder in New York state issued two slightly different messages about its plans for drilling in the watershed that provides 90 percent of New York City's drinking water. On Wednesday morning, Chesapeake Energy Corp. announced that it had voluntarily decided not to drill in the watershed in upstate New York. But later that evening, at the state's first public hearing on proposed natural gas development in the Marcellus Shale, the company said it would object to any official state ban on drilling in the watershed. "It would be improper to ban drilling in any particular area of the state, as such a ban is inconsistent with the declared legislative policy to promote recovery of this resource and amounts to a regulatory taking of the mineral interests affected by such a ban," said Scott Rotruck, Chesapeake's vice president of corporate development, who read from a prepared statement at the meeting. Chesapeake did not respond to requests for an interview. So what does Chesapeake's pledge actually mean? 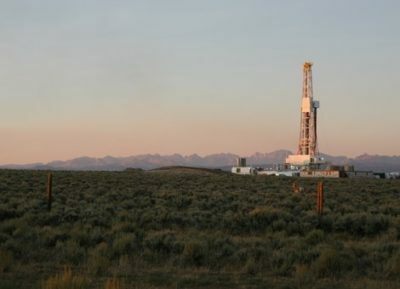 Legally, it doesn't mean much, said gas lease attorney Joshua Bernstein. Chesapeake could change its mind and go ahead with its drilling plans. It could also offer its leases to another company. "The way the lease is drawn up, they could turn it over to anyone," Bernstein said. Environmentalists and some state legislators say the only way to make sure the watershed is protected is to officially ban drilling there. "I call on both the Department of Environmental Conservation and the governor now to ban drilling in the watershed," said Deborah Goldberg, the managing attorney at Earthjustice, formerly the Sierra Club Legal Defense Fund. "It is needed to make sure that the promise is permanent." Assemblyman Jim Brennan, D-Brooklyn, who has legislation pending that would prohibit gas drilling in the New York City watershed and within five miles of its border, said such a ban would not amount to a "regulatory taking." "The state has the power to protect public health and safety," Brennan said. "It's not an indirect taking of property. The state has the right to protect its residents." Brennan said 22 other assembly members have signed on as co-sponsors of his bill, and Sen. Tom Duane, D-Manhattan, is carrying the bill in the Senate. New York City Mayor Michael Bloomberg's administration hasn't taken an official position on the drilling ban. But the city's Department of Environmental Protection continues to push for further assurance that the water source will be protected. "One company's voluntary moratorium at this point is no substitute for a thorough analysis by the state DEC and the state Department of Health to determine the potential of drilling failure in the watershed and damage to critical infrastructure in adjacent communities," said Michael Saucier, spokesman for the city agency. Chesapeake's no-ban-is-needed approach to the watershed issue drew support from Dennis Holbrook, an executive vice president at Norse Energy Corp. USA, which holds leases 100 miles west of the city's watershed. "It's not as much that I'm concerned about the ability to drill safely within the watershed as much as I am about the public perception," Holbrook said. "My approach is that the watershed is a sensitive area, and there are other areas to drill right now, so why don't we focus on those and in the future this issue can be revisited if it's appropriate." John Conrad, a hydrogeologist with Conrad Geoscience Corp. in Poughkeepsie, said there's no reason to be concerned about the drilling because New York's drilling regulations are already stricter than elsewhere. "I know there is at least a perception that hydro-fracturing and horizontal drilling somehow generates new risks for groundwater," he said. "The truth is that they don't, as long as procedures are followed that are required in New York." Sabrina Shankman was an intern at ProPublica.